was chili garlic. 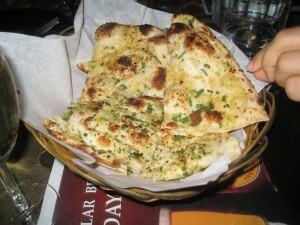 I ended up being a big fan of the chili naan, since it offered a kick, but not a huge one. Then it was time for the main courses. I decided to split a couple dishes with the roommie. 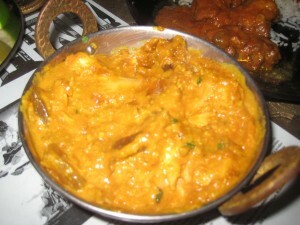 Our first choice was Chicken Dehraduni, which was chicken cooked with cashews, coconut and mango. For our next choice we decided to be a bit more exotic and ordered some bakra, also known as goat. 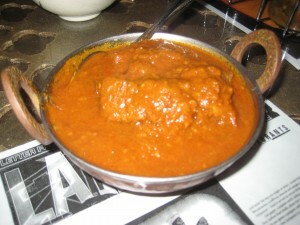 I had never eaten goat before, so we kept it simple with Bakra Curry. While waiting for my main courses, I tested out this new beer and was extremely disappointed. It was poorly carbonated, which I could have gotten over if it tasted good, but it did not and for the first time I felt that $3.00 was too much for a beer at a restaurant. I hoped my meal would fare better. Luckily, it did. The chicken dish was great. The mix of spices with cashews and mangoes made a deliciously complex taste. The goat was also pretty good. I thought it would taste pretty similar to mutton, but it really didn’t. In fact, it was closer to beef than lamb, but still kind of hovered between the two. The curry sauce it was in wasn’t too bad either. 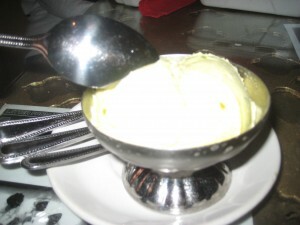 To top off the meal, we ordered some Kulfi, Indian ice cream. It’s different from regular ice cream because it’s extra creamy and extra tasty. It was certainly very different from any other ice cream I’ve had before, and was a good way to finish off dinner at Ambala Dhaba. As I’m no Indian aficionado, I can’t vouch for the authenticity of any of my dishes, but I can definitely say I enjoyed them thoroughly.